Yes that is cunning. I think he is using 16 propeller pins to talk to the Z80 (including the clock). I sort of ran out of pins once I had assigned pins for audio, keyboard, VGA, SD card but there would have to be some cunning solutions around. I also wanted to add bank switching as I have an idea to extend CP/M with a whole lot of touchscreen driver routines and move all that code into a separate bank so the bios/bdos doesn't get any larger. Once you need a latch for the bank switching that is one chip and then it seemed the MCP23017 chips had the lowest count. But there could well be another cunning solution. I have another design using one propeller chip and more TTL glue chips and that does have 8 pins to talk to a Z80 so there are some options there. One thing very nice about the mini80 is the experiments with running the Z80 on lower volts. That can save a couple of LVC chips. And also the experiments pushing it out to 10Mhz - that ends up being faster than any propeller emulation could possibly run at. There are also some experiments that can be done with pasm - for instance at the moment to send a bit from the Z80 to the propeller I send it into a latch and then the propeller reads the latch. But the prop might be fast enough to capture an IORQ. Esp if the propeller was running the clock, you could then slow down the clock. Or, any IORQ could go into the propeller and the prop could output a /WAIT to the Z80 and then slow down the clock. Ok, that has got me thinking. Pin audit on the prop - along the top, 2 for download, 2 for i2c, 2 for audio, 2 for keyboard, 8 for display. Along the bottom - 4 for SD card. But if you think about it, when the propeller is fetching data or writing data to the SD card, the Z80 is not going to be doing much, so you could share some pins there. One pin for /CS on the SD card, if it is low then talk to the SD card, and if high, talk to the Z80. eg the SD clock pin could clock the Z80 too. No need to be clocking the Z80 while card access is happening. So in a general sense, this could give you 15 propeller pins to talk to the Z80. That opens up a lot of possibilities, particularly if the Z80 is running at 3V3 as well. One could replace the slow i2c bus MCP23017s with some TTL chips that could use a byte wide data interface. DMA should be possible. Need some 245s to isolate the Z80 from the prop when it is running. Maybe some latches for the address, but perhaps that idea in the mini80 of pushing data into the Z80 could be used. CP/M uses a DMA area from byte 80H to FFH but it could be lower, right down to byte 03H if you wanted (mem location 0,1,2 would be a jump to another ram location). Ok, the gauntlet has been thrown down. Take a propeller chip, 2 pins download, 2 for i2c, 2 for audio, 2 for keyboard, 8 for VGA and 4 for SD card. That leaves 12 pins. Put a HC245 (or 244 or any other 8 way buffer chip) on the VGA pins. Use these for the bootstrap and control the Z80 pins like reset, busrq, rd, wr, iorq and mreq. Control this with P11. Bootstrap the Z80 before turning on the display. Once the Z80 is running, this buffer chip is never enabled again. Use the mini80 circuit to bootstrap the program in. But one more cunning thing. Instead of the buffer on the /wr line, use a resistor eg 470R. So the Z80 thinks it is reading an instruction, its /rd line is low, /wr is high, override the /wr with a low but the resistor prevents any damage to the Z80. Then put zero (nop) on the data lines and carry on. So far - one 245 chip, one ram and one Z80. P0-7 are the Z80 data bus. Two pins left - P8 and P9. How can we capture IORQ with those and still allow addresses to other ports too? How about Z80 A7 goes to P8 and IORQ to P9. To talk to the propeller, do either a rd or wr to any port from 128 to 255. There are not enough prop pins to decode if it is a read or a write, but no matter, talk in nibble mode and set one bit in the byte to say if it is a read or a write. Still just one 245 chip. Any iorq to ports 0-127 still work as normal and you can bring out the whole Z80 bus to a 40 pin header etc. Pins - P0-7 = data bus to Z80 data bus, P8= Z80 A7, P9-Z80 iorq, P10 = Z80 clock, p11 = 245 buffer enable to bootstrap, P12-15 = SD card, P16-23 = VGA and also 245 bootstrap chip, P24-25=keyboard, P26-27 - audio, p28-29 = I2C bus, P30-31 - serial port. need a weak pullup on (say) D7 if this is the pin that flags if it is a port read or write. If it is a write make this low and the prop knows to read the pins. If a read it will be high due to the pullup and the prop knows to put some data on the pins. I have used the "RED" 2 pins and "GREEN" 2 pins as the SD card's 4 pins before by altering the mask that is in the VGA setup ( 0F instead of FF). that gives H,V, B low and B High which was split over the three VGA outputs to give a dark blue background and a White(ish) foreground. That wasn't the Romless boot that I was thinking about, but thanks very much for dangling yet another distraction in front of me! He has a tristate buffer to disconnect some of the busses at reset, I have a thought that whilst the reset is low then a fair few of the pins go hi-z anyway. I look into that, it could be that that was back in the days of non CMOS chips. The couple that I have are the 10MHz ones that he thinks could be under marked higher speed ones. At least the clocking via the Prop will allow for the max to be found, and suitably backed off from. I was just about to print a PCB for the CX80 too. I have just looked up what happens on a Z80 reset. The Addr and Data lines go Hi-z but the control signals get driven HIGH, as in inactive. I wonder how soon a /busrq could be stuck in? busrq - higher priority than NMI and is always recognised at the end of the current machine cycle and data, address and output control lines go to high impedance so other devices can control these busses. reset - three clock cycles. With a minimal circuit, one may never even use busrq anyway. Load in a bootstrap program and issue a reset and then you have an intelligent program to talk to. When I get some time I'll draw this up and see if any flaws become obvious. btw that was a nice find by Heater spotting how the mini80 bootloader works. Saves quite a few chips. I found a few 20Mhz Z80s on ebay just now and couldn't resist buying some *grin*. I was laying out a rats-nest from that schematic, until I noticed there are errors on it. the Z80's Busrq and Reset lines and a couple of pullups are all commoned. The theory of stuffing the data buss with NOPs is what I remember of "the other" romless booting. Stuffing NOPs on the data buss was also a trick Sir Sinclair used on his ZX81 which was use in the display functions. I am very interested in the direction of this project is going. I may blow the dust off my Z80 chips and jump in . That was about 30 year's worth. That trick was also used (originally?) by Don Lancaster for video timing on his TV Typewriter. On the AVRs they often use a very short sleep (snooze??) to account for any in-determinant timings of interrupts. Yes there are a few errors on that schematic. He has put wire joins where every wire joins a chip (not needed on Eagle) but has left out some joins that are needed. No matter, the gist of the concept is clear. I'm going to see if I can draw up a schematic. I was pondering also adding memory bank switching using two more optional chips. My circuit at the beginning of this thread has the bank switching controlled by the propeller, but Z80 purists would probably prefer the Z80 was in control. The N8VEM has a good system with sixteen 32k banks and the top bank is always selected whenever A15 is high, so CP/M is always in memory. Attached is a concept schematic. It has three extra chips for bank select, and it should be possible to leave out the 138, the 374 and the 32 if just a 64k system is needed. For such a system, one could not decode any ports and any /IORQ would be captured by the propeller. If also detect /WR, then the propeller can work out if it is a port read or write and either read data or put data on the bus. If ports are being decoded then one needs a 138 or similar. I've tweaked that schematic a little. There is a minimalist circuit using just one buffer chip (244 or 245) for bootstrapping, and you can detect use /iorq and /wr to detect port reads and stop the clock and transfer data. I want to add banked memory and that adds another three chips. Ok, not so minimalist. But... I think I can then add a touchscreen without needing any more chips at all. These touchscreens are coming down in price. I saw one on ebay for $14 including shipping, and that gives you an SD socket as well as a 320x240 full color display. Previous designs using the touchscreen have used a 16 bit bus and dumped graphics out 16 bits at a time. For a little sacrifice in speed it is possible to use the display in 8 bit mode. The manufacturers call this "8080" mode, and I think it can interface very nicely with a Z80. Data lines go to data lines. /RD and /WR are as expected. And then there are three latch outputs to /CS, RS and Reset. The latch is already there from the bank select. The catch - there are not enough propeller pins to run the touch SPI interface, so these have to be shared with the VGA pins. On the other hand, it is unlikely one would use the VGA and the touchscreen at the same time, so this board lets you use one of TV, VGA or touchscreen, depending on which components are installed. Next little challenge - I've been using Seeed Studios for PCBs and their price for five boards 5x5cm is $9.90, 10x10cm is $20.90 and 10x15cm is $45.90. So there is a bit of an incentive to get the board down from 10x15 to 10x10cm. Something had to go and the something was the SD socket. But it does not matter so much as there is an SD socket on the touchscreen, and also I brought out a header for those 4 pins and I have some little 5x5cm boards already made with SD sockets. For real world interfacing there is the Z80 bus but I think the I2C bus on the propeller is more convenient, so that is also brought out to a header. I think the Z80 might end up being quite a useful co-processor for the touchscreen. Possibly better than the Propeller even, as up to 512k of graphics can be stored in the banked memory and dumped out quickly to the display - much quicker than a propeller could read data off an SD card. Good for game sprites. 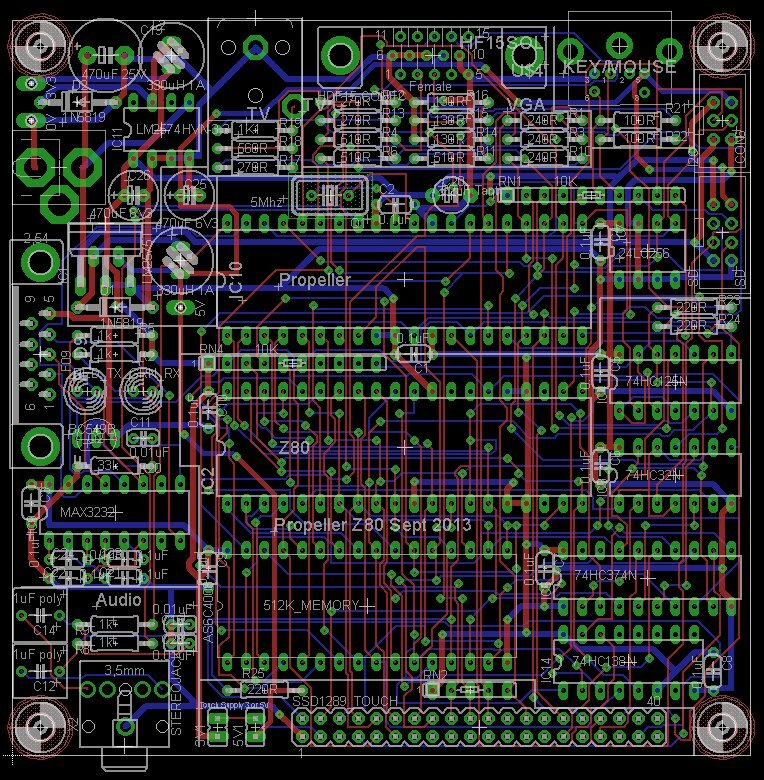 This is interesting stuff with good ideas for bootstrapping the Z80. I have an old Z80 CPU lying around at home, and I've been meaning to hook it up to a prop at some point to see how they could play together and this thread is giving me some motivation to try it out - not sure about the 3.3V Z80 operation part though, I might want to run it at 5V and use resistors to drop the voltage a bit for not frying the prop I/O. 2.2kohm resistors worked okay for me at 5MHz in other projects for limiting the prop's internal protection diode current. After looking at your latest schematic I saw a potential issue with how your banked latch worked. After reset it would contain random data until first written by the Z80. This would not let the correct bank be written until A15 went high (eventually). After a subsequent reset the CPU will start at address 0 and it would not be reading from the right bank until the latch is loaded. To get around this issue one alternative bootup method that can be used after reset is to feed opcodes from the prop into the CPU directly when it does its memory reads and let the CPU itself load the boot program into high memory backwards with the stack pointer and PUSH operations. I was thinking you could feed it with something like this pattern of opcodes below out to the data bus. You would need to monitor the !RD signal after reset and just assume the presence of the MREQ signal based on the program being loaded. You would also need to control the prop's data bus pin directions at the appropriate time in the read/write sequence to avoid bus contention - you do need to be careful there with instruction timing. It will take slightly longer than your method due to extra LD,PUSH opcodes required but it will load high banked memory and you could jump into this code too. From memory I think the SP register is zeroed after reset, if not you could always preload it (to wherever in memory you want to end) before the push sequence is started. Even though it adds another I/O pin you might want to consider bring a Z80 address line into the prop if you want to use it for I/O. A single 8 bit R/W port is not very flexible to encapsulate multiple audio/video/serial/SD accesses by the Z80. I know you can split it into nibbles etc, but this drops the I/O throughput and adds compexity. A single address effectively line gives 2 read ports and 2 write ports (eg, 1 indirect WO address reg and RO status reg, plus a R/W data port) That combination can be rather versatile and should suffice for this purpose. You might be able to save a pin by using the I2C clock signal to clock the Z80 unless you need I2C for other purposes. I'm still trying to come up with a scheme that avoids the extra 74HC125. I think at a minimum you would need to observe !IORQ, !RD, A0, !RESET and CLOCK from the prop. This combination could let me do it but I would still need to assume !IORQ low without !RD low is an IO write, and this could have issues during interrupt acknowledgement cycles which drops !IORQ and !M1 but not !RD or !WR. But if no interrupts are used it could be okay. It also needs to share the I2C SCL pin as the Z80 CLOCK but personally I don't have issues with that - however some people could. Then if no SRAM banking is used it could mean a minimal 4 chip solution, RAM, Z80, PROP and i2c BOOTROM allowing VGA, UART, SD, PS2 KBD, and stereo AUDIO out. That would be pretty cool if it's possible. One extra chip may be needed for RS232 level conversion, or you could just use a FTDI cable. Wow, some clever thoughts there. Yes, I noticed the latch problem too - but <after> I sent the board off to be made. I am hoping it does not matter. Assume the latch starts up in any random bank. Whatever random number it does start in should not change. So one should be able to send a program to memory location zero and run it and move data to the high bank and once it is running in the high bank the bank latch can be addressed. It may take two bootstrap programs. That is the theory anyway. Keep thinking about different designs. You could be onto something with the 125. Maybe replace with a MCP23008? Without banking there certainly is a very minimal chip count. Maybe someone will rustle one up on a breadboard? let the CPU itself load the boot program into high memory backwards with the stack pointer and PUSH operations. That could be really cunning. While I am waiting for the boards in post #44 to come, I am working with the board in post #1. Errors so far - needs 10k pullups on Z80 pins, and A8 goes twice to the ram chip. Minimalist version is one propeller, two MCP23017 chips, one LVC 245, one LVC 374, one 32 or gate. Writing a little bootloader that can send data. This is serial mode and the schematic in post #44 will be at least 8x faster. But slowly building up a little bootloader code and getting it to run is fun. Next step is getting CP/M running.
' gives a propeller another 32 input and output pins. Futurlec sell these chips for $1.20. DIP28 narrow package.
' if using sockets and can't source 28 pin sockets, use two 14 pin ones. delay.pause1ms(1)                                    ' small delay to wait for Z80 to respond, and could be a lot shorter than this. PUB Z80ChangeBank(bank)                                 ' uses Z80Bank %000 to %111. PUB Z80WriteByte(address,data)                          ' address includes the bank so A0-A18, 512k. Digging around in the bottom of the storage room boxes I also turned up a stash of old (spelled obsolete?) chips. A few Z80H and 84C00 processors. But no book or datasheets. aka http://tinyurl.com/mnjj957 Z80 datasheet for the current chips. On the other hand, the z84C0020 is listed as a 20 mhz part! The 84C0020 is really a 20 MHz part. As long they are CMOS parts, and both the Z80H and 84C0020 are, for sure, their operating frequencies can be directly scaled down if you lower the operating voltage, within certain limits, naturally. I don't know exactly at what extent it can be done, one must carefully test the allowable working range, but simultaneously lowering both the operating voltage and frequency, it will not harm the CPU itself, it only poses a limit to its usefulness as a valid control signal generator such as address lines and !MREQ, !IORQ, !RD, !WR, and the like. The 4.5 V lower limit shown in the specs sheet is there in the belief one will expect 'see' TTL level signaling and, of course, correctly interpret data and control inputs like !WAIT, !BUSRQ, !INT and !NMI, all specified in the TTL realm. When a design falls out of the specified range, NORMAL operation is not ENSURED, but in no way it is FORBIDEN to try it and check its stability. According to my own experience, back in 1998-99, when I tryed to extend the operating range, both upper and lower, for clock frequency and operating voltage, was to tight regulate the power supply and filter out as much noise as attainable, using several combinations of ceramic and tantalum capacitors. A refined layout was also done, since the experiments were done using a two layer circuit board and a lot of capacitors in a gridded distribution to obtain <40 mV of total noise, measured with a good osciloscope at Z80's and RAM's power pins. And be certain that i've payed a lot of attention to heat development/dissipation when my work was done, specially when pushing the limits to higher voltages and frequencies. Another concern, during my work, was with data integrity, so I decided to copy the testing software, at low speed, from a cmos eprom into a fast cmos static cache ram, 20 ns if I do remember correctly. A clock circuit, specially crafted according Zilog specs and that only stops in sync with the !M1 fall, to avoid RAM data corruption, was used to start/stop the clock, allowing the muxed selection of another frequency, and that restarts manualy, under the control of two debounced switches, commanding a 74HCT flip/flop. !RESET was always applied before checking normal operation thru the tests, without reloading the RAM. Also I followed every design tip available in Zilog's application notes, with respect to active/resistive pullups and everything else I could find to read and learn. As an upper limit example, using GAL22V10-15 and 74ALS gates to do the glue logic, I could push a Z80A to 8 MHz@5.0Vdc, limited to 10 minutes, without using heatsinks nor frying it. As a lower limit, using a Z80H with GAL22V10-15 and now 74HC gates to do the glue logic, It sustained 6MHz@3.8Vdc, now with an almost cold CPU and more than 30 minutes long. Since I don't intended to interface it to 3.3V logic, I'd never pushed it to a lower limit than that. Both setups used a 74HC374 with shorted Din/Dout's, LE and !OE controlled by !IORQ, !RW and !RD to succesfully test basic I/O operations. In another setup, INIR and OTIR were tested directing I/O operations to upper RAM memory, by tweaking the 22V10 and forcing A15-A08 high during !IORQ windows by the use of pullups and a 3-stated 74HC374. So, my conclusion was, there is always room for testing and improvement. That's pretty awesome work, Yanomani. to use the Prop as a byte-wide peripheral. 8 data pins, a couple of address pins, a chip select pin, and /RD or /WR? This takes about 8 instructions at 200ns each to respond to a read request and another 6 instructions to go back to idle for the next request. That's 1.6us access time and 2.8us cycle time. Write cycles are faster. If you want address decoding, that takes more time. I'm sure this could be done better and faster, but this gives a worst case. I'd probably use hub memory instead of cog memory for the device registers and use the address bits as part of the hub address. That would certainly slow things down further, maybe adding 3 instruction times plus hub access time (up to 1us). Golly Mike! Talk about impossible! Well, I was thinking mode of a waitpne type thing for /CS, rather than polling. But looks like polling is unexpectedly mighty quick. For video memory - how to address a particular location? Write a control word to indicate what you are doing (write video address)? another byte to go in that location (or set attributes at that location)? set attribute(s)? color, blink, invert,? That might get pretty messy pretty quick. But it would be so much faster than serial. ESPECIALLY for graphics oriented touch screens where there is so much to write. PS: maybe just one address pin? and then the routine readwrite can take as long as it likes, as the clock has stopped. There should be lots of time in the pasm code for this - quick experiments with a 4Mhz Z80 and it starts to fail with anything less than about 14 nops between clock cycles. I have a feeling based on experiments some years back that the 55ns ram chip needed 2 or 3 nops to be reliable. So the propeller should be more than fast enough to test a pin each clock cycle. You could also add a SPLD to do some simple state-engine handshakes, and handle the clock without having SW loops impact all clock cycles. Prop can still generate the raw MHz clock, for easy scaling and tests, but pauses are managed in PLD. SW delays then only need delay those where the Z80 and Prop know they are in direct dialog. Thinking out loud, from the Z80's perspective, collecting a series of bytes will involve, at the least, 4 instructions? a port read/write, then read/write to ram, then increment the ram counter, then do a loop (djnz). But using the direct memory stuffing routine, DMA access might be a lot quicker. Block read write in CP/M is done in 128 byte blocks and the memory for this is between address 128 and 255. I wonder if there is a way of doing this in one Z80 cycle - eg the Z80 has some code at around address 120 which is a loop with an OUT or IN instruction. This tells the propeller to take over. The propeller starts putting nops in until it gets to address 128 (maybe there is an instruction at 127 as a marker) and then stuffs the data in, or reads the block. From the Z80s' point of view this would be one instruction per direct memory access rather than 4 bytes. Doing things like that was my bread and butter, most of the time, but in the that specific case, was adding knowledge to my savings and a lot of enjoyment! When you are commenting about the number of 'nops' you used to fill the loop of flipping Z80's clock signal, you stated that a minimum of 14 was needed. Looking at the code snippet shown above, if one demands something nearly shaped as a square wave, it does not means that it would be better to balance the amount of nops for each high and low level branch? I'm thinking this way because 14 nops@80MHz will last 700nS and adding the pin level fliping and decision making instructions certainly will give a <1MHz clock frequency. Since I have almost no experience in Propeller programming, have I missed something that otherwise was obvious? You are right - it does seem a bit slow. Maybe it is something wrong with my board layout? The code I was testing that with also was doing some data transfer and maybe that is the problem. I need to do some more experiments! One thing that is nice with the propeller is the way you can test things out really slowly with Spin first, and then move things into Pasm later. Makes debugging a lot easier, especially when you can completely stop the clock and test all the pins with a logic probe. I think it was not an error. As a true doc, you can call this a 'perfection addicted old man, full of memories' maniac behavior! Since I've moved to Rio de Janeiro, i left my whole databook and application notes collection behind me, about 150kg. Fortunately my grey matter, and all the memories it carries, persists inhabiting my head. "z80 cpu clock buffer circuitry"
Don't be affraid, it lasts almost a century to download, but worths each bit. I'm unsure if it is/was needed on the CMOS versions, must Google and study a little before stating with any confidence. This takes about 2.2us for a read cycle and 1.9us for a write cycle. I figure roughly 2us more to add the use of address bits to access an array of locations and to use hub memory instead of cog memory. To avoid further amending my last post, this is a following to its contents. After searching and comparing their specs, bearing in mind the fact that an old style design like the Z80A does have specific needs in its clock tree input pin, as shown in Mostek's literature, i've found Fairchild's NC7SZ04M5 TinyLogic UHS Inverter an almost perfect replacement for the F04. I hope you feel confortable soldering a male Drosophila Melanogaster sized SMT. Despite the fact it exhibits only five legs, maybe it proves to be an interesting mutation! The Prop would then be busy poking nops instead of shoveling in data. True DMA on a Z80 is usually done between mem/IO cycles, isn't it? Like jmg said, just stop the clock. The Z80 is a static device. Since there are lots of peripheral circuits that can be controlled by the Propeller itself and sparing a few pins could be of great value, i'm wondering if, at the cost of a bit longer loop, one could not create an indexed file of registers, whose pointer was settle in a previous Z80 commanded I/O write operation into the Propeller. There are plenty of examples of using such strategy to avoid connecting address lines to peripheral circuits. The data lines are a must, even in cases one don't need the full eight set. Address lines could proof an expensive luxury. Even address auto increment schemas, for exchanging information in blocks, are feasible.